I’m like a lot of horse gals out there… I’ve talked nonstop of horses since birth but only started seriously riding in my early 20’s when my parents couldn’t stop me. Though life derails my riding plans every so often, I remain a true Horse Junkie, always circling back to the barn — just as happy to scritch noses as I am to fly across a beginner novice xc course (well, almost). I started making Horse Junkie Gear after returning to riding in my mid-40’s following a pretty long hiatus (work, kids — you know the drill). Of course I filled my closet with Kerrits, Ariat and other great performance gear at the time (definitely enjoying a larger budget than when I rode in my 20’s), but what I really wanted were some comfy tees. 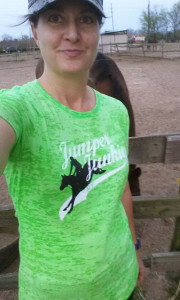 You know, cute, fitted tees that look good in the ring and out, and definitely under $40 — a rare find in most tack stores! My tee search came up short, so I shook the cobwebs off my graphics programs and created a few designs which grew into the Vintage Horse Junkie collection. After positive feedback from my Eventing, Jumper and Dressage barn buddies, I created some new lines: Breed Tees, the Barn Life is Better cartoon series, and more. Then I found a great printer who makes them to order in the color and size you want. But why stop there? I’m a professional shopper after all — always searching the markets, both horsey and home. So I started a blog to bring you all the great deals, ideas, faves & finds that I come across. Plus it gives me a place to ramble about my oft-bizarre antics with my 18h partner-in-crime, Buddy. I hope some of my horsey finds fill a need in your barn life — and that my horse tees inspire your addiction!